December 8, 2012 – 2:10 P.M.
First Watch is a chain restaurant (prominently in the midwest) with numerous locations nationwide. We visited the location at 7305 W. 95th Street in Overland Park, KS. First Watch is self-proclaimed “daytime cafe,” open for breakfast and lunch, closing in mid-afternoon. Their menu is available on their website. They also have Facebook and Twitter. Location/Environment: The location we visited is conveniently placed in the middle of a strip mall near 95th & Metcalf. The environment is simple — standard, suburban brunchery. It’s not notable, but it’s clean and inviting. Neither negative or positive, simply the norm. The regular wall hangings were wrapped in Christmas gift wrap, giving a festive feel. The cups and spoons were water-spotted. Not dirty, but notable. First Watch does offer wifi, and with the capability of handling large groups, it would be ideal for business brunches. Service: The service was very accommodating, and genuine. We visited the location near closing, and they were more than generous with our meal. Menu/Selection: The menu offers your general breakfast and lunch options. Omelets, pancakes, waffles, sandwiches, salads and soups. They put their special spin on omelets and pancakes, offering many unique options in both. The menu does change slightly, but if you don’t see what you want, don’t be afraid to ask. First Watch is usually vary open to pleasing your needs. If it’s not clear by now, if french toast is an option, I will almost always eat up on that business. French toast is my jam. Not jam as in preservatives, jam as in NBA Jams 2K10. Last week I mentioned that IHOP’s french toast is one of my staples. First Watch’s sourdough variety is absolutely my number two dependable french toast. Three thick slices of sourdough bread, french toast-ed to perfection, and dusted with powdered sugar. The bread retains its softness through the process, leaving it incredibly tender and moist. It acts as a sponge, soaking up butter, syrup and flavor, then bursting in your mouth with every bite. The meal comes with a side of blueberry jam (preservatives, not jam like the Michael Jackson song). I’m not a fan of jam on my french toast, but I’m sure it would be a great pairing with the meal if that’s your thing. With a side of crisp bacon and a cup of coffee, this meal is reliably 2 legit 2 quit. First Watch is the location where Stephen and I first came up with the amazing idea of the Panclog! So once we got this journey of breakfast up and going, we had to go back to the beginning. First Watch is known for their 9″ pancakes. I had to conquer these beastly cakes. I ordered three of the banana granola crunch variety. It had fresh ripe bananas mixed into the batter with a cup of granola. The banana and granola complement each other very well. The butter was already in a melted state when I got the plate. That means that the pancakes were fresh enough to keep the heat. These pancakes were tasty and the service made them superb. These pancakes are priced squarely in my wheelhouse at $5.89. A negative of the First Watch pancakes was the size of the plate underneath the pancakes. It was too small. I worry too much about if my copious amount of syrup will runneth over the side. That makes me sad. I am always excited to have First Watch and their large pancakes. Tharpe out. Firstly, I want to thank Stephen and Jared for allowing me to participate in a Panclog adventure. I have been a fan from the beginning and consider it the highest of honors to have been invited to participate. While First Watch’s suburban location and run-of-the-mill appearance and decor are not a plus for me, the food and service are definitely above average. I won’t deceive you, Panclog readers: I have enjoyed a First Watch “Bacado” once before. This Bacado is priced at $8.29. You should take it as a credit to its deliciousness that I elected to choose it again, this time for the purpose of reviewing it. If you’re a fan of avocado, you will love the Bacado: bacon and avocado even distributed in an omelet topped with sour cream (plus a little more bacon and avocado). Don’t forget the crispy, seasoned diced potatoes and lightly-buttered english muffin on the side – beautiful. If it had been served just slightly warmer, I would have labeled it perfection. Price: First Watch is another suburban brunchery that sets its price very close to the competition. The price is what you would expect from any after-church restaurant. Overall: First Watch is a wonderful place to have any sort meeting. This store had an amazing staff. They were very fun to interact with. They seemed to care deeply about your meal. Though, you will not be blown away by how low-key any of the locations are. You will enjoy your experience. You can follow Emily, Jared, and Stephen on Twitter. 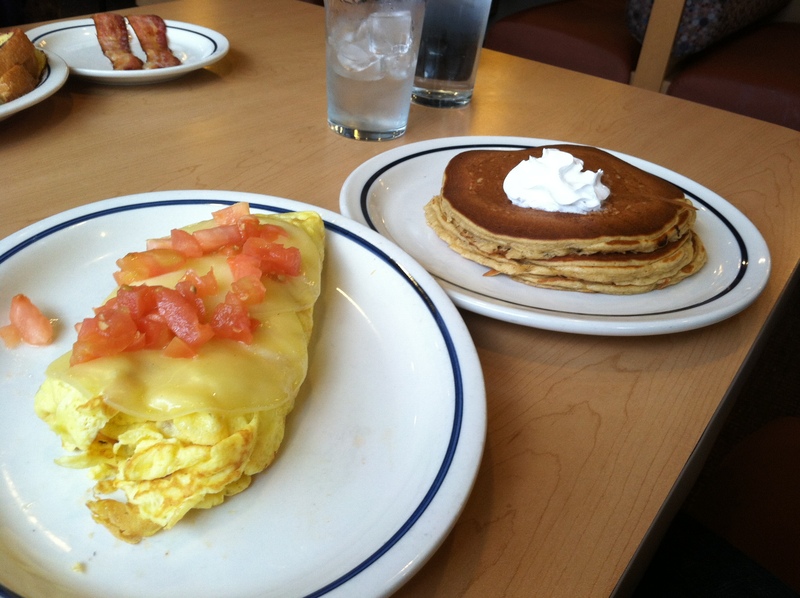 October 25, 2012 – 5:03 P.M.
IHOP is a chain restaurant with numerous locations nationwide. You already know this, dear reader.We visited the location at 9099 Metcalf Avenue in Overland Park, KS. Most locations are 24 hour diners (including the location we visited). Their menu is available on their website. They also have Facebook and Twitter. Location/Environment: This particular location has been open less than a year. We celebrated the location’s opening with a baby shower only months ago. It’s fresh and sprite – it has a very unlived-in feeling. This is a plus, because it’s clean and crisp. However, it doesn’t give you a good idea of how it’s going to be down the road. Service: Nick, also known as Captain Awesome via his nametag, was our server. He was friendly and kind, making sure we were taken care of but also giving us our privacy. Menu/Selection: They offer options for every time of day, but that doesn’t mean you’ll want to order willy nilly. Stick with what you know. While everything will probably be fine, it is the International House of Pancakes for a reason. They don’t specialize in steak. Ya dig? IHOP’s original french toast has become my standard idea of what french toast is or should be. When I think french toast, I think of three pieces of bread, cut diagonally and placed symmetrically on a plate with a dollop of butter placed in the center. And it’s not just the aesthetic of french toast, it’s the taste. 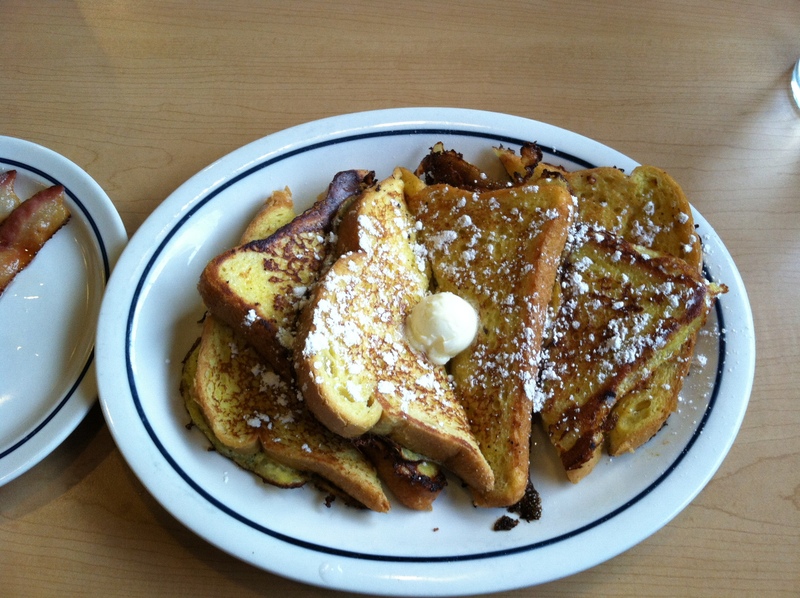 IHOP’s french toast is dependably the same, every time, and in a completely suitable fashion. Warm, soft, perfectly rich, and a perfect match for a few strips of bacon. At $6.29, it’s an affordable meal. It’s not the best french toast I’ve ever had, and that probably won’t change, but it’s something I crave often, which says something. IHOP is a special place to me. I have been calling this my favorite restaurant ever since I tasted sweet pancakes on my tongue. I have had many wonderful experiences with IHOP. I have skipped school to be with IHOP. I have waited terribly long to get free pancakes on National Pancake Day. I took my wife to IHOP on our first date. 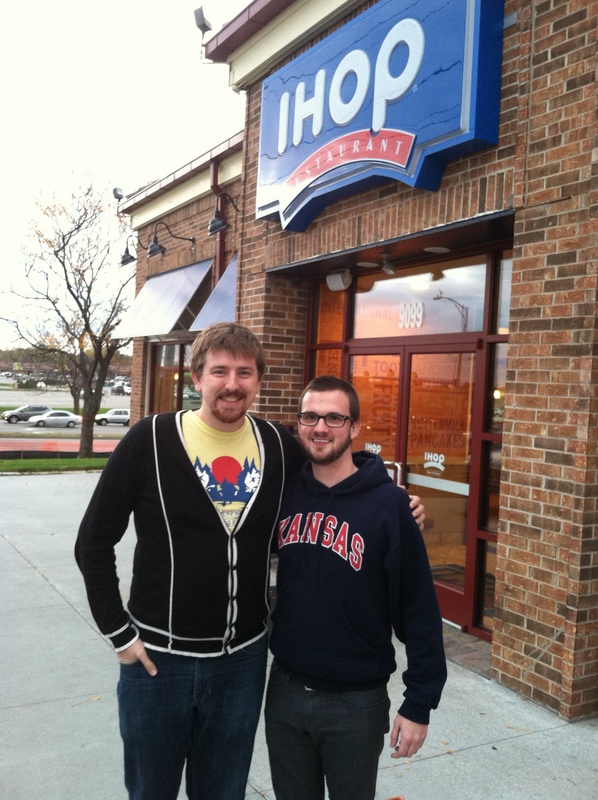 IHOP is also the place where we had our DTR. (A DTR is a Define The Relationship talk. We became girlfriend/boyfriend.) I even celebrated this specific IHOP’s baby shower. IHOP and I have been through thick and thin. SO…. needless to say IHOP holds a very special place in my breakfast-loving heart. This is my go-to order at IHOP. It is the build-your-own-omelette. This include a burrito sized omelette with 3 pancakes, all for $5.99. You can add toppings to your omelette for 59 cents each. I added fresh tomatoes to make it “healthy”. IHOP has a nice array of different syrups: Old-Fashioned, Blueberry, Strawberry, Butter Pecan, and my favorite Boysenberry. The pancakes I had were of the pumpkin variety. The pumpkin pancakes are not on the IHOP menu all-year. They are one of their seasonal pancakes. IHOP’s menu is always changing because of the seasonal items which is a +. These did not have a dollop of butter, but a swirl of whipped cream with cinnamon on it. These pancakes were very good. It had a creamy texture with a nice nutmeg-y twist. These pancakes being of a savory flavor would not be a good pairing with a fruity syrup. I used butter pecan syrup. This meal has great size for an appropriate price. Price: Being the standard in chain 24 hour breakfast joints, you’ll find the pricing pretty steady. Maybe not as cheap as Denny’s, but the service and food quality is slightly better, in our opinion. Of course, this will vary by location. They often have specials which are actually enticing, and quite a bit of food for the price. Overall: IHOP is a staple in the national breakfast landscape. It is truly the easiest way for a breakfast rookie to taste the breakfast rainbow. You can try almost any breakfast food for a reasonable price. While you can try most traditional breakfast items at IHOP, local breakfast nooks are a better place to find a more unique, higher quality breakfast.